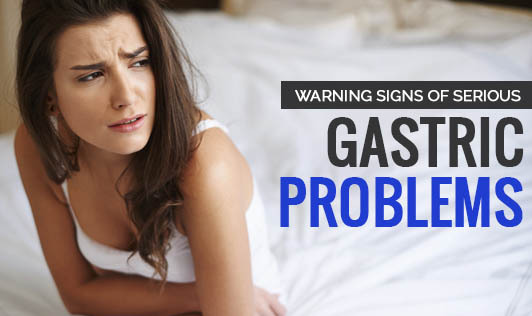 Are you prone to frequent gastric problems? Not every symptom can lead to a serious digestive problem. Here are a few ‘alarming' symptoms which would need immediate medical attention. • Difficulty or pain while swallowing: This might be caused due to improper absorption of food. When you eat foods like meat or bread and you feel food lodgment in your chest or food getting stuck while going down the esophagus, it could be possibly caused due to excessive scarring in the esophagus. It might be a symptom of esophageal cancer. Get it checked if this is happening frequently. • Frequent heart burn: In most cases, a heart burn can be relieved by an antacid. But doctors warn that the occurrence of heartburns should not be more than twice a week as it could be a symptom of GERD (gastroesophagal reflux disease) in which the stomach content moves back into the esophagus. If left untreated, it can lead to long term GERD and eventually cancer. • Early satiety: If you feel full with a very small amount of food which is not usually normal to you, consult with your doctor immediately as the cause of concern may be a muscular disorder inhibiting the wave like movement which pushes the food along the digestive tract. In extreme cases, it might be a sign of stomach cancer. • Abdominal pain: Sudden abdominal pain, anywhere, anytime, is a sign of caution. Abdominal pain accompanied by vomiting may be a cause of pancreatitis or H pylori infection. Fever accompanied by severe abdominal pain could be appendicitis. • Changes in bowel movements: Normal variations are common, but if there is a prolonged variation, then the cause might be a polyp in the colon which can be cancerous and has to be removed before it ruptures. • Unexplained weight loss: If a person is not dieting or exercising and there is weight loss of 4kgs or more over a couple of months, it is considered abnormal. This could be a symptom of peptic ulcers which left untreated can lead to pancreatic cancer. Do not make your own diagnoses, instead, meet your doctor and get the right treatment at the right time.